Born at Xanten on the left bank of the Rhine, near Wesel, c. 1080; died at Magdeburg, 6 June, 1134. His father, Heribert, Count of Gennep, was related to the imperial house of Germany, and his house of Lorraine. A stately bearing, a penetrating intellect, a tender, earnest heart, marked the future apostle. Ordained subdeacon, Norbert was appointed to a canonry at Xanten. Soon after he was summoned to the Court of Frederick, Prince-Bishop of Cologne, and later to that of Henry V, Emperor of Germany, whose almoner he became. The Bishopric of Cambray was offered to him, but refused. Norbert allowed himself to be so carried away by pleasure that nothing short of a miracle of grace could make him lead the life of an earnest cleric. One day, while riding to Vreden, a village near Xanten, he was overtaken by a storm. A thunderbolt fell at his horse's feet; the frightened animal threw its rider, and for nearly an hour he lay like one dead. Thus humbled, Norbert became a sincere penitent. Renouncing his appointment at Court, he retired to Xanten to lead a life of penance. Understanding, however, that he stood in need of guidance, he placed himself under the direction of Cono, Abbot of Siegburg. In gratitude to Cono, Norbert founded the Abbey of Fürstenberg, endowed it with a portion of his property, and made it over to Cono and his Benedictine successors. Norbert was then in his thirty-fifth year. Feeling that he was called to the priesthood, he presented himself to the Bishop of Cologne, from whose hands he received Holy Orders. After a forty days' retreat at Siegburg Abbey, he celebrated his first Mass at Xanten and preached an earnest discourse on the transitory character of this world's pleasures and on man's duties toward God. The insults of some young clerics, one of whom even spat in his face, he bore with wonderful patience on that occasion. Norbert often went to Siegburg Abbey to confer with Cono, or to the cell of Ludolph, a holy and learned hermit-priest, or to the Abbey or Klosterrath near Rolduc. Accused as an innovator at the Council of Fritzlar, he resigned all his ecclesiastical preferments, disposed of his estate, and gave all to the poor, reserving for himself only what was needed for the celebration of Holy Mass. Barefooted and begging his bread, he journeyed as far as St. Giles, in Languedoc, to confer with Pope Gelasius concerning his future life. Unable to keep Norbert at his court, Gelasius granted him faculties to preach wherever he judged proper. At Valenciennes Norbert met (March, 1119) Burchard, Bishop of Cambray, whose chaplain joined him in his apostolic journeys in France and Belgium. After the death of Pope Gelasius (29 January, 1119) Norbert wished to confer with his successor, Calixtus II, at the Council of Reims (Oct., 1119). The pope and Bartholomew, Bishop of Laon, requested Norbert to found a religious order in the Diocese of Laon, so that his work might be perpetuated after his death. Norbert chose a lonely, marshy valley, shaped in the form of a cross, in the Forest of Coucy, about ten miles from Laon, and named Prémontré. Hugh of Fosses, Evermode of Cambray, Antony of Nivelles, seven students of the celebrated school of Anselm, and Ralph at Laon were his first disciples. The young community at first lived in huts of wood and clay, arranged like a camp around the chapel of St. John the Baptist, but they soon built a larger church and a monastery for the religious who joined them in increasing numbers. Going to Cologne to obtain relics for their church, Norbert discovered through a vision, the spot where those of St. Ursula and her companions, of St. Gereon, and of other martyrs lay hidden. Women also wished to become members of the new religious order. Blessed Ricwera, widow of Count Raymond of Clastres, was St. Norbert's first spiritual daughter, and her example was followed by women of the best families of France and Germany. Soon after this, Norbert returned to Germany and preached in Westphalia, when Godfrey, Count of Kappenberg, offered himself and gave three of his castles to be made into abbeys. On his return from Germany, Norbert was met by Theobald, Count of Champagne, who wished to become a member of the order; but Norbert insisted that God wished Theobald to marry and do good in the world. Theobald agreed to this, but begged Norbert to prescribe a rule of life. Norbert prescribed a few rules and invested Theobald with the white scapular of the order, and thus, in 1122, the Third Order of St. Norbert was instituted. The saint was soon requested by the Bishop of Cambrai to go and combat the infamous heresies which Tanchelin had promulgated, and which had their centre at Antwerp. As a result of his preaching the people of the Low Countries abjured their heresies, and many brought back to him the Sacred Species which they had stolen and profaned. 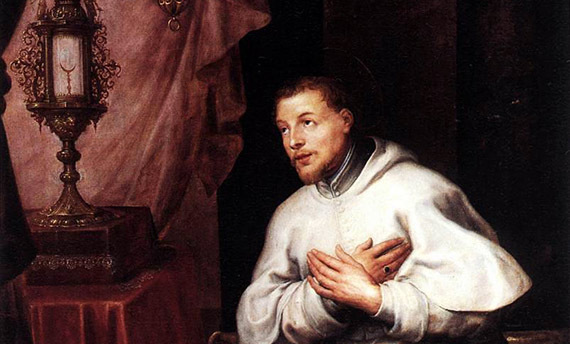 In commemoration of this, St. Norbert has been proclaimed the Apostle of Antwerp, and the feast of his triumph over the Sacramentarian heresy is celebrated in the Archdiocese of Mechlin on 11 July. The rapid growth of the order was marvellous, and bishops entreated Norbert to found new houses in their dioceses. Floreffe, Viviers, St-Josse, Ardenne, Cuissy, Laon, Liège, Antwerp, Varlar, Kappenberg and others were founded during the first five years of the order's existence. Though the order had already been approved by the pope's legates, Norbert, accompanied by three disciples, journeyed to Rome, in 1125, to obtain its confirmation by the new pope, Honorius II. The Bull of Confirmation is dated 27 February, 1126. Passing through Würzburg on his return to Prémontré, Norbert restored sight to a blind woman; the inhabitants were so full of admiration for him that they spoke of electing him successor to the bishop who had just died, but Norbert and his companions fled secretly. Soon after this, on his way to Ratisbon, he passed through Spier, where Lothair, King of the Romans, was holding a diet, the papal legate being present. Deputies form Magdeburg had also come to solicit a successor to their late archbishop, Rudger. The papal legate and Lothair used their authority, and obliged Norbert to accept the vacant see. On taking possession of it, he was grieved to find that much property belonging to the Church and the poor had been usurped by powerful men, and that many of the clergy led scandalous lives. He succeeded in converting some of the transgressors, but others only became more obstinate, and three attempts were made on his life. He resisted Pietro di Leoni, who, as antipope, had assumed the name of Anacletus and was master in Rome, exerting himself at the Council of Reims to attach the German Emperor and the German bishops and princes more firmly to the cause of Pope Innocent II. Though his health was increasingly delicate, Norbert accompanied Lothair and his army to Rome to put the rightful pope on the Chair of St. Peter, and he resisted the pope's concession of the investiture to the emperor. Norbert, whose health was now much impaired, accompanied the Emperor Lothair back to Germany and for some time remained with him, assisting him as his chancellor and adviser. In March, 1134, Norbert had become so feeble that he had to be carried to Magdeburg where he died on the Wednesday after Pentecost. By order of the emperor, his body was laid at rest in the Norbertine Abbey of St. Mary, at Magdeburg. His tomb became glorious by the numerous miracles wrought there. The Bollandists say that there is no document to prove that he was canonized by Innocent III. His canonization was by Gregory XIII in 1582, and his cultus was executed to the whole church by Clement X.